Virtual desktops is a feature that is new to Windows 10, having been a part of macOS and most linux-based OS' for many years. They are a useful feature, and one that can be very powerful when used correctly. 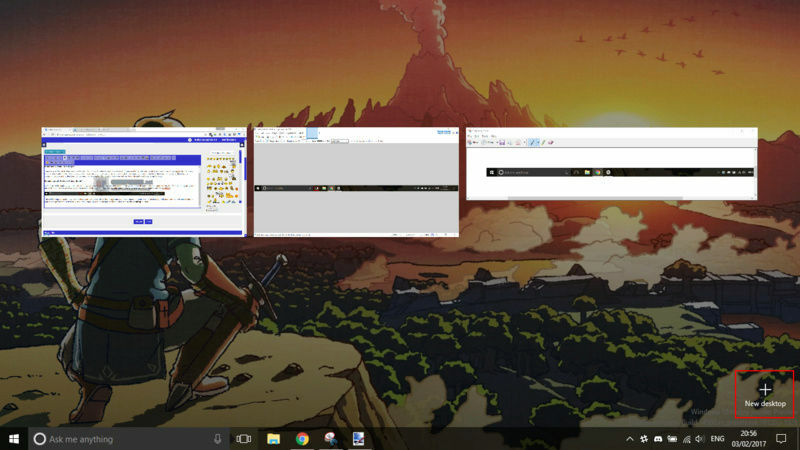 They're exactly what they say on the tin - Windows 10 allows you to create multiple desktops, all with a different set of multiple applications open. How is this useful? Well it allows you to organise your open programs into different groups; you might have a desktop for work, a desktop for communication and a desktop for games, for example. Obviously, how you set up your virtual desktops is up to you. Sounds great! How do I use them? If you want to move programs between desktops, simply drag and drop the applications window in Task View to the appropriate desktop (when you have more than one desktop open, they will all show at the bottom of Task View). You can also switch between desktops using the keyboard shortcuts Windows key + Ctrl + Left/Right Arrow keys and Windows key + Ctrl + F4 will close your current desktop. chat_bubbleHow much do you thing I could sell my complete Virtual Boy set for?